The City of London is a lively place at the best of times, but when the City of London's summer festival comes to town, it takes things up a notch. From talks to walks, music to visual arts, and movies to dance, the festival will be filling the City with so much fun that if they're not careful the Square Mile will be in danger of actually splitting down the sides. Incredibly, the City of London Festival has been going since 1962, with a different theme every year. 2011's musical programme will take a special look at talent from Australia, New Zealand and the South Pacific. The City is bursting with a huge range of unique and stunning architectural gems, and it is these that will be used for the festival's venues, together with a selection of its best and most beautiful open spaces. OK let's cut to the chase. This year's festival is offering 50 ticketed events, alongside a whopping 100 free ones. 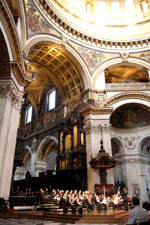 26th June – What better way to mark the start of the City of London Festival than with a choral performance by the choir of St Paul's Cathedral. This is a free event. 28th June – Enjoy a tour of the residence of the Lord Mayor of the City of London, Mansion House. This wonderful example of Georgian architecture, completed in 1752, is truly a sight to savour. Tickets for the tour cost £10. 1st July – It's not every day you get to see a group of Maoris paddling down the Thames, so make the most of it and go give them a warm welcome to the City of London. Sixteen Maoris will be making their way along the river in a waka, an ornate carved war canoe. It's not thought they paddled all the way from New Zealand, though you never know. This is another of the free events. 5th July – Performing inside the grand Church of St Bartholomew the Great will be the award winning Schubert Ensemble. Their entertaining set includes two Australian composers - Brett Dean and Peter Sculthorpe. The £20 ticket includes a glass of wine. -- 9th and 10th July – Join a Walk on the Wild Side which takes you on a journey through the green spaces of the Barbican Estate to Bunhill Fields. The tour costs £10 and is taken by a qualified City of London guide. -- 22nd July – This one sounds intriguing – called Commuter Music and taking place at Liverpool Street Station, the event promises "a knees-up from Down Under". A folk band all the way from Australia will be putting on the entertainment at the station's main exit, kicking off at 5.30pm. See the festival's website to find out about the full programme of events. Why? Because it's a whole lot of entertainment packed into a square mile. When: 26th June to 12th August, 2011. Where: Various venues in the City of London. Cost: Depends on particular event.